Never would anyone have thought that a school which produced one of Sri Lanka’s top cricket coaches located in the surroundings of the famous P. Sara Oval cricket ground, would be a haven for young footballers. Veluwana College, situated in Dematagoda, Colombo may have their reasons to be proud about Chandika Hathurusinghe, the former Sri Lanka opener who transformed himself into a coach who is good enough to head the New South Wales team in Australia. But according to school officials, football runs deep in the veins of the youngsters of Veluwana, who enjoy the luxury of stardom within the walls of the school. But in reality, these football-mad youngsters could be considered less privileged for many reasons, despite their school being quite well known in Colombo. Veluwana’s footballers as a matter of fact have nothing at all in their possession when it comes to facilities. There are times when these youngsters borrow boots, leg guards and other equipment from rival teams and on some occasions from their own opposition. These players, who form the Under-19, 17, 15 and 13 age group football teams for Veluwana, consider themselves juvenile units of ‘Real Madrid’ and ‘Barcelona’ in the neighbourhood of Dematagoda and Wanathamulla. This undying passion towards the game has made this bunch of youngsters the most loved ones in the neighbourhood and this they consider a blessing in disguise. “We are blessed with the overwhelming support given to our boys by the veteran footballers from the nearby ‘Mohamed ground’, where we conduct practice sessions. We have the zealous backing of veteran players like Mr. Gamini and Mr. Nihal Chandrasiri. They have contributed so much to uplift our football, which stands out from other sports at Veluvana,” W. Karunathilake, the school’s principal, revealed. Unlike in other schools, cricket is not the central sport at Veluwana. Although it enjoys reasonable popularity, the school’s football players have managed to overthrow every other sport, making their chosen game not just the most followed sport at school but also in the entire vicinity. The success of the Veluwana footballers at different age categories in the recent past has added much-needed flavour to the sport despite its ever growing demand for basic needs. 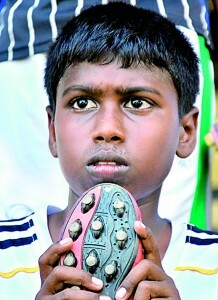 Their Under-13, 15 and 17 teams have gone on to win the Colombo District championship in 2009 and 2010. This year they kicked off their campaign by winning the Zonal Championship in all age categories. “Last year our cricket teams became the Under-17 Division III champions and Under-19 Division II runners-up. Despite those feats, football has proved to be the flagship sport and it still keeps growing. As of today, Veluwana has attracted over 200 students and the number keeps swelling. Most of these players come from low-income families and these parents are not in a position to afford the (sport’s) expenses. In that case the roles of our masters-in-charge, Gathika Gunaratne and Nandana Sugath, are commendable. There are times when they pocket out their own money for these youngsters,” Karunathilake added. These youngsters who show immense talent share the same playing kit at official games in all age groups. Amusingly the similar looking kits, which are replicas of an official kit worn by the players from a popular football club in Europe, were gifts from veterans at Mohamed ground. They lack the financial support for other sporting gear such as boots, balls and other necessary needs. But they have the basic support which is needed to run the game, the ground and coaching facilities which come free of charge from the generous veterans of the neighbourhood. And those high performing big names in world football are the icons of these youngsters, who tend to follow their styles on and off the field. Apparently football has become part of their life as the youngsters are gradually being transformed into an unconquerable unit on the field by the veterans.